We’re big bicyclists so after giving away our 13-year-old car we went car-free for about 6 months. But over time we felt we were missing out when it came to camping trips or visiting our friends in far-flung suburbs. So we gave in to needing a four-wheeled option. I am a committed environmentalist, and I work in sustainable transportation at UC Davis, so a plug-in seemed like a great purchase. Cost was also top-of-mind. I’d been hearing all these stories from my family and colleagues at UC Davis about how tax incentives and fuel savings made going electric a “good deal” financially. John, my husband, was resistant to going full battery electric, but he was compelled by the “good deal stories” too. So after much discussion, we compromised on a plug-in hybrid. After test driving the Kia Niro, we were sold. 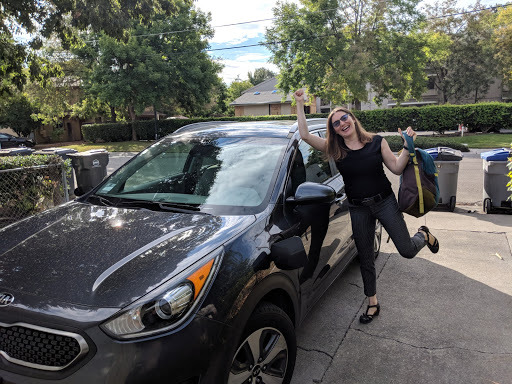 The Kia Niro doesn’t have as much of an electric range as I would like (only 27–30 miles per charge), but it’s a good lookin’ hatchback (meaning we can fit our bikes in!) and delivers a super smooth and comfortable driving experience. It felt so much safer than our old clunker. It also has a lot of automated features, adaptive cruise control and lane-keep assist, that make me a better driver. Federal and state refunds were a big factor in deciding to lease an EV. We made out pretty well despite going for a plug-in hybrid rather than a full electric car: we received ~$6,500 off the sticker price after combining state and federal incentives. Even though we rely on the gas engine more than we could/would if we restricted our travel to shorter trips, we average about 60 MPG, which is quite good mileage. It feels like a win-win to get a good deal from both an economic and an environmental perspective! Since we have a plug-in hybrid we are not challenged at all. I try to charge whenever possible to save gas, but the fact that we can rely on gas when we need to means that it’s no problem to go on longer trips in the Niro. Even though I work in transportation, I believed the rumors that battery life depletion issues affect the long-term value of an EV. But after finding out that in California, EV batteries are under warranty for 150,000 miles and 10 years I realized this is a non-issue. Also, I think people don’t realize that you can charge an EV using a regular household plug. The dealership gave us a free convertor with the lease. It’s like plugging in your phone. We’ve never driven on a long trip without using gas. But we went to Patrick’s Point in Humboldt County for a camping wedding and the car did great capturing lots of electric charge on the downhills and keeping our MPG pretty high. A plug-in hybrid is a very easy way to enter the world of EVs, and can be a good option for people not yet ready to take the plunge of going fully electric. I would suggest everyone thinking about getting an EV do it sooner rather than later because the public incentives available now may not last forever. You’ll save at the dealership, at the pump, and in your conscience, so it’s a win-win-win!